A chamber with a mycelium compound which is suspended in the air, surrounded by the sounds of heavy breathing. Projected onto the wall are microscopic video recordings of the artist’s oral cavity, combined with bizarre scenarios of a lab coat-wearing human interacting with contaminated organisms. Before entering, the spectator looks into this chamber through a glass window in the door - similar to how the cultivated mycelium substrate is being observed within the incubator. The installation refers to the process of mycelium cultivation. The whole process requires strict control - thorough sterilization, constant observation, and immediate treatment once identify contamination. contamination is a relative concept and only exist within the context of intention: anything unwanted is considered as a contamination. 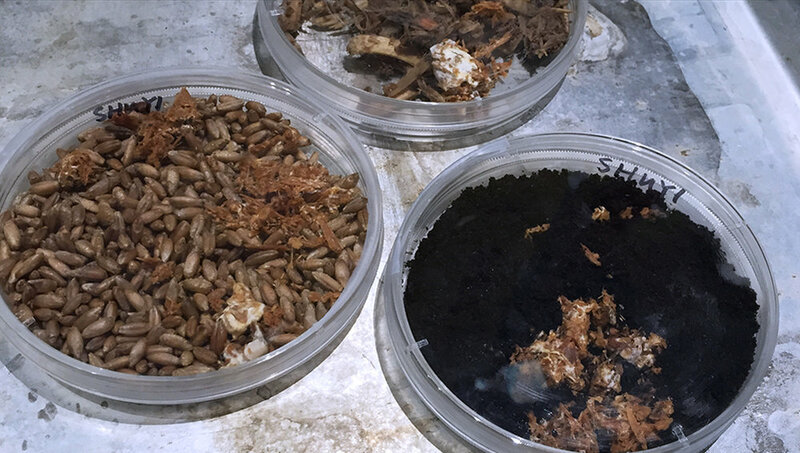 the exposure to human microbiome through contact or breathing is the main cause of contamination; however the contaminative source reverse once the contamination is detected in the cultivation. Considering the power dynamic during the phases of protection, recognition and separation: who is protected from whom? who is recognized by whom? who is the host and who is hosted? who is cultivated and who is aliened? who decides and when? the process involves multiple scales of agencies and domains which are constantly transforming between layers of permeable boundaries - the cell membrane, the petri dish, the plastic wrap, the incubator, the disposable glove, the mask, the skin, and organic and inorganic bodies. By inverting the perspectives and obscuring the boundaries, this work aims at creating the ambiguity as well as the tension between the inside and the outside, the self and the other.